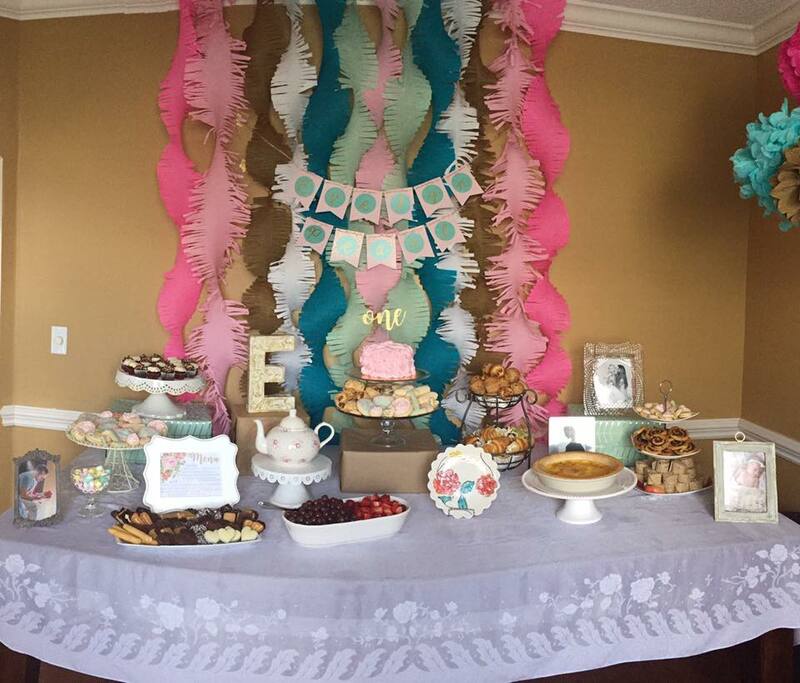 After having two boys, I was thrilled and excited to throw my sweet little girl a fancy, frilly, lacy, girly first birthday party! Initially I had ideas of a chic vintage tea party, but in the end I steered clear of any true "theme," and just went with "girly and fancy." This was a true DIY party, as I made all the decorations myself. I really enjoy crafting, so I had a lot of fun creating the details for the party. We had about 25 people (children and adults) at the party. The kids enjoyed playing a couple party games, breaking open the piñata, and jumping on the trampoline. The adults enjoyed mingling and eating, and reminiscing about how fast the past year had gone. As guests arrived, I asked to get a picture of our family with theirs right away before everyone got lost in the shuffle. I then printed the pictures right form my phone (my printer is wireless) and put them on display at the party. (This whole part was my husbands idea!) We then sent everyone home with their picture. This was a hit with the guests! The menu consisted of chicken salad croissants with havarti cheese, sausage pinwheels, ham and cheese pinwheels, bacon and cheddar quiche, fresh fruit, assorted chocolate cookies and wafers, personalized sugar cookies, lady fingers, apple stuffed sugar pastries, mini chocolate chip muffins, mini blueberry muffins, mini chocolate cupcakes, mini red velvet cupcakes, and of course, a smash cake for the birthday girl! A close friend of mine is an amazingly talented baker, and she made the personalized sugar cookies for me! One of my favorite parts was when we sang Happy Birthday! I bought a sparkler candle in the shape of an "E" at a boutique near by. The sparklers were so awesome. It was definitely the coolest candle I had ever seen. We created a time capsule by asking the guests to write down a memory, wish, or letter for the birthday girl. In addition to the DIY decorations, I displayed pictures of Evelyn's "firsts," as well as the baby book scrapbook I made for her over her first year. We sent the kiddos home with their piñata candy, as well as a personalized mini planter with some seeds for them to plant. The day turned out to be everything I hoped it would be and more!